When I chose Nicaragua as the destination of my big trip in 2018, I was far from predicting that the country would be in conflict at the time of my visit. With the airline tickets purchased in January and some booked stays, I began to hear about the conflict in Nicaragua weeks before departure. When President Ortega announced the increase in taxes and cuts in the social reforms, it was the drop of water for the Nicaraguan people. Demonstrations against the ruler and his executive began at the hands of university students but soon spread throughout the country. On the eve of the trip, I was contacting our expat’s friends who live there or whom we knew and who were in the place on vacation. The information was that there were demonstrations in various cities and roadblocks, but nothing indicated that the situation was aggravating. We decided to go ahead. What I found was a country in turmoil, but I never felt insecure. The trips were longer because the roadblocks were too many, just letting vehicles pass from time to time. 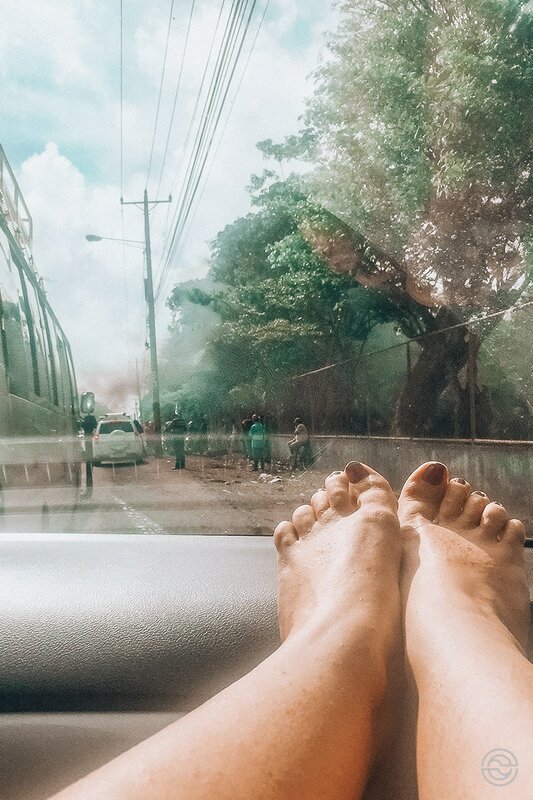 But leaving the road and the main cities, like Managua, to the shoreline, we almost weren’t aware of what was happening. Except for comments that were often exchanged between tourists and locals. 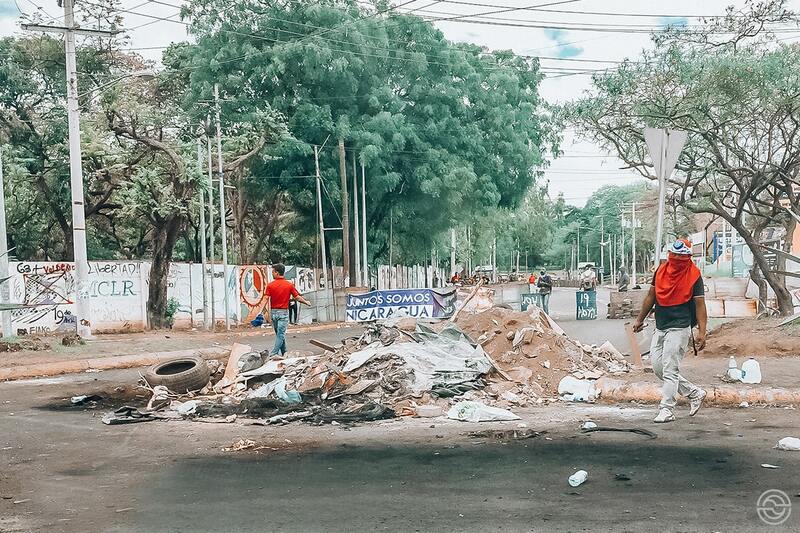 The topic of conversation couldn’t be another: the conflict in Nicaragua. Of those responsible for the lodgings where I stayed, to the gentleman with whom I sat down to have a coffee by the side of his small shop, everyone with whom we spoke regretted the situation. “We are sad about what’s happening, and we don’t want you to get a bad impression of us or our country. We want you to return one day to visit us, “said the man with the cup of coffee in his hand, stressing his fear that this whole situation will become the same as in Venezuela. At the barricades were we stopped, we got out of the car, and we approached the men who were stone (literally) and lime cutting the road. With frowned faces and grave expressions — for many, even scary — they began to explain calmly and correctly that they couldn’t let us through. They were defending their rights, fighting against a dictatorial government and asking for our understanding. “For a free Nicaragua!” we could read everywhere. In one of these road barriers, near Granada, they distributed a small piece of paper apologizing to the drivers for the inconvenience caused. 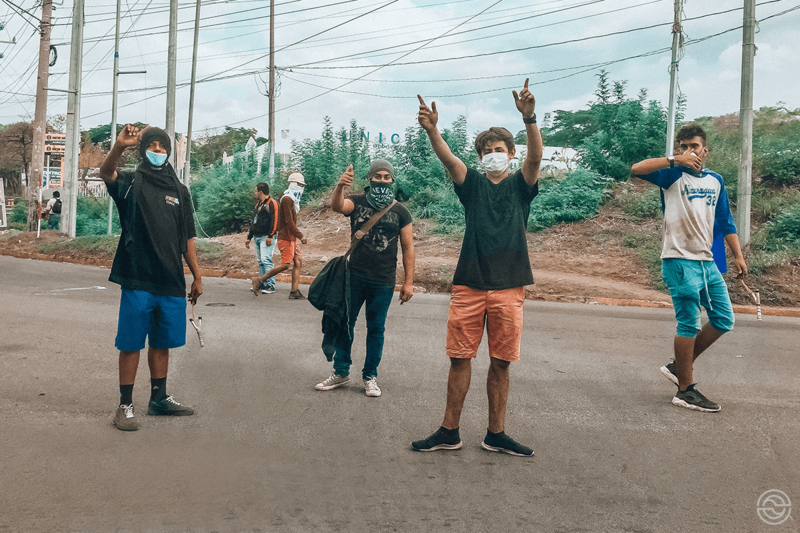 Although the protests are peaceful, the truth is that dozens of Nicaraguans have died or been injured in situations of conflict with the police. Although this black count is one of the saddest results of the entire conflict in Nicaragua, another aspect is making people worried. During the last years, Nicaragua has affirmed itself as one of the best tourist destinations in Central America, even surpassing neighboring Costa Rica. Tourists have begun to turn to this country for its natural beauty, cultural past, safety, and of course for the surf. A whole economy began to develop around this sector. However, the current internal situation has alienated foreigners, and this has been reflected in the business, with terrible consequences for the people and their families who take their income from here. During my stay, I became aware of several lodgings that decided to send many workers home because the influx of clients didn’t justify their presence and their expense. 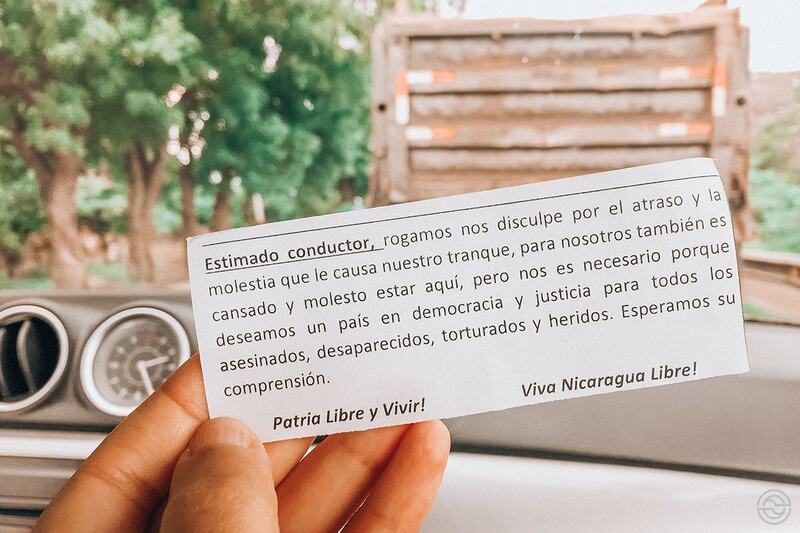 This, coupled with the fact that everything is happening in the rainy season (low season), affects, even more, the businesses and the Nicaraguans. At this moment I can’t guarantee that a trip to Nicaragua will be calm and free of danger. Demonstrations, roadblocks, clashes with the authorities continue and, to date, no end in sight. You can always venture out and, from what I have experienced, you’ll be welcomed by the Nicaraguans. Their “war” is with the government and not with the tourists. And then there’s always the advantage of being able to visit the country with fewer tourists than usual. I decided not to stop writing the articles I have in mind about Nicaragua. It’s my way of helping the people and ensuring that their country continues to be seen as a travel destination. A small contribution so that people continue to have jobs and that the last events aren’t the only image that we have of that place. One thing I assure you: the country is beautiful and well worth visiting! And even if it’s not now, let it be soon, when, hopefully, things will be calmer. Always keep your passport at hand. Or have with you a copy and keep the original in a safe place. Depending on the case, you can always choose to interrupt the trip. Ensure your safety above all else. These are just a few tips that I think are important. Well, some of them are essential regardless of the country you’re visiting. If you have others to share, please write in the comment box below, and if you’ve ever been to a conflict country, tell me all about your experience. I’ll love to know more! Marlene, this is an interesting post. I think having expat friends who live there certainly helped you to ascertain whether you felt comfortable going ahead with the trip. My heart goes out to the citizens, and I so hope the conflict comes to an end quickly. 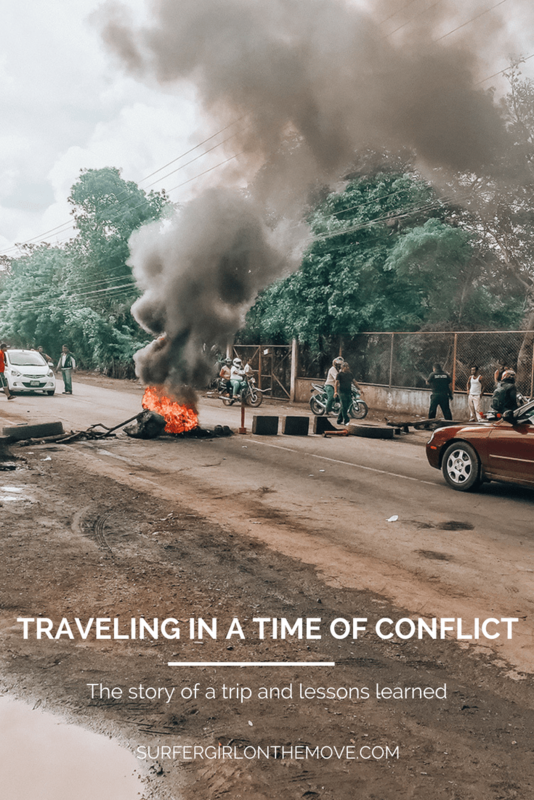 While I would not head into a country when this kind of unrest is happening, the truth is that most of us who travel extensively could be somewhere when something like this happens. I think your list of suggestions is a good one to follow just in general — and that way if you suddenly end up in a conflict zone, you’re much better off. So true, Ann. We can’t predict something like this to start when we are visiting a country. And we should always try to access the security, political and economic stability of a country before we book a trip. Thanks for your feedback on the post. I visited Istanbul during some major demonstrations around 1 May. I also never felt that I was not safe, but was just a bit more wary of where I went and what I did. It’s just a case of using common sense. Turkey was also badly affected by the negative publicity and tourism has suffered, It is sad really because like Nicaragua it has so much to offer. Yes, it’s so sad that this kind of situation affects the whole country. But, let’s hope it has a right and quick end. Thanks for your comment, Janine. I travelled to Lebanon at a time of conflict as well and I can totally relate to the tips you’ve given in the end about things to take care of when you’re travelling to a foreign country during such a time. It’s very important to let family back home know of your itinerary and communicate with them regularly, to let them know you’re okay. Also, it’s important to stay abreast of the latest happening, read the news regularly to know exactly what to expect and take a decision accordingly. I hope the conflict doesn’t last very long and peace is brought back there asap. That’s also my wish, Medha. Thanks for sharing your experience. It’s such a shame that Nicaragua is falling into conflict like this, I spent a month in this amazing country in 2016 and I fell in love it. For such a poor country, people like you’ve mentioned are so friendly and they really don’t need to struggle more than they already were. I’m glad you’ve mentioned that even though there is turmoil going on the people will still welcome you as their issues are with the government. I’ve been in other countries where this is the case but others do get frightened off because of the turmoil. I do hope there comes an end to the turmoil and doesn’t turn into a full-blown civil war. That’s also my wish, Amit. People are so nice, and they do need their jobs and stability to support themselves and their family. Hope everything turns out for the best for them. Conflict unrest due to social or political upheavals at the country you are visiting is a reality that a traveller can face any time. It is so important to be well informed and aware of the situation. One of the things to do is obviously to research the place you are visiting and be aware of the issues at hand. Hope Nicaragua is fully normal soon and sees a stream of visitors coming to appreciate its wonderful natural beauty. Absolutely, Sandy. A little research before any trip is also recommendable. Thanks for sharing your opinion. I’m glad you were safe throughout your trip and were able to bring some positive perspective to all that you experienced. Thanks, Vanessa. All went quite well, taken the situation. And I hope things calm down soon. The situation doesn’t look good there and you still took the decision to travel. Hats off to you gal. I agree with all the tips you have mentioned here. Hope to see Nicaragua in normal state and flooded with visitors soon. Thanks, Suruchi. It was a risk, I know, but I tried to keep informed, before and during the trip, and was ready to end it if things escalated. It is so heartbreaking to know about the conflict and it certainly will have an impact on their tourism. My country has some parts that were in some sort of conflict, too. While those parts are really beautiful, residents and the economy are suffering and of course, tourists are just really afraid to go there. What a shame. I hope people can set aside differences and the conflict in Nicaragua ends soon. That’s also my wish, Kirstie. Thanks for sharing the situation in your country. Hope everything turns out well. I am sorry to see what is going on our world. Traveling during the conflict can ruin your trip and sometimes can be dangerous. It is nice of you trying to show people that the country is a tourist destination. I have seen other nations when media make them look dangerous or bad. But to be honest their people are friendlier same as the guy was talking to you. Those people would like the westerners to look at them differently and see the beauty of their nation. I would recommend everyone who and you when you travel anywhere to have the phone or emergency number your consulate. That’s a great tip, Mansoureh. It doesn’t hurt to take with you some emergency numbers. You never know what can happen. Thanks for your comment. It is sad to see that a country with so much beauty is avoided owing to their internal situation. Don’t blame the travelers for everyone wants to be safe but it sure is a pity. Glad though that you have shared interesting tips of making it safe for yourself. This was a lovely and enlightening read.